Why is it called Ice Cream Sandwich? Google has named each version of Android after a dessert item, in alphabetical order. 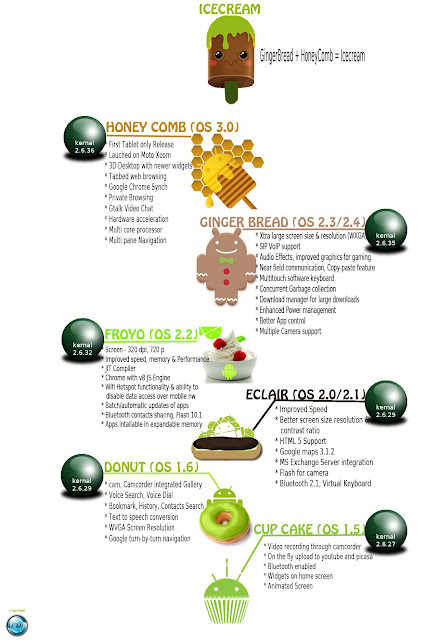 There was once a version of Android named Cupcake and later versions named Donut and Eclair. A few phones sold on the market today are still running Froyo, and Gingerbread is currently used on the majority of new Android phones. The version known as Honeycomb was designed for and is used on many new Android tablets. Why would I want Ice Cream Sandwich? Ice Cream Sandwich is a big deal, and it differs from every Android operating system before it. Ice Cream Sandwich blends parts of Gingerbread and parts of Honeycomb into a single version of Android that can be used on both tablets and smartphones. Android owners have long been plagued by something called fragmentation. With fragmentation, software that is written for one version of Android might not look so hot or work the way you expect it to on a device running another version of the OS. With different manufacturers releasing phones with a wide range of specs and custom software, it can be hard for developers to create apps that work for all phones and for phone makers to create phones that can be easily updated to new versions of Android. Ice Cream Sandwich is expected to unify Android as a whole and set a few norms that should make the updating and development processes a little easier. The OS also offers quite a few new innovative features that are well worth a look. Visual updates: If you're already an Android user, then Ice Cream Sandwich is going to look a lot different than what you've become accustomed to over the years. Google has completely overhauled the OS to make it more user-friendly, giving the entire operating system a new modern font and a magazine-like feel. Improved camera: The camera app in Ice Cream Sandwich comes with a number of built-in photo editing features, so you can adjust your pictures directly on your phone. Improvements include basic things like red-eye reduction, cropping and straightening, and Hipster filters that add Instagram-like effects to your photos. The camera also has a single-motion panoramic mode, allowing you to take panoramic shots quickly and easily. Voice typing: Android has had voice recognition capabilities for a while now, but Ice Cream Sandwich takes things a bit further by allowing you to say what you want to type. The feature will likely come in handy when you need to send a message while driving or when you need to keep your hands elsewhere. Improved contacts and voicemail: Ice Cream Sandwich improves how Android displays your contacts with the People app. The app lets you see at a glance how you're connected to someone, as well as check out that person's latest moves on social networking sites. The OS also integrates visual voicemail, which lets you view and play each of your voicemails individually rather than having to listen to all of your messages at once. Voicemail can be sped up or slowed down while you're listening. Face unlock: More a parlor trick than an actual security feature, phones and tablets running Ice Cream Sandwich can be unlocked using your face rather than a secret code. Early tests of the feature have shown that a phone can be unlocked with a picture of you rather than your actual face, and your phone may have trouble recognizing you depending on the lighting where you are and whether or not you're wearing makeup. Still, it's a clever little trick to have up your smartphone sleeve. Android Beam: Android Beam lets you "beam" content back and forth between two phones by holding them together. For instance, if you had pulled up directions to a restaurant and wanted to share them with a friend, you can hold your phone up to your friend's handset and use Android Beam to load the exact same map on your friend's phone. Data usage graph: With the rising cost of data plans and the extinction of the unlimited plan, monitoring the amount of data you use on your phone has become more important. The data usage graph in Ice Cream Sandwich helps you track your data usage, as well as see what apps are using the biggest share of your monthly plan, so you can zero in on any problems you have. Set up alerts to let you know when you're reaching your monthly data allotment and disable the data hogs. Other improvements: Ice Cream Sandwich adds a number of other small tweaks and improvements such as the ability to take screenshots, save web pages to view offline, and create folders for apps. There's also a new calendar app with pinch-to-zoom functionality. Will all phones have Ice Cream Sandwich? The first phone to be released running Ice Cream Sandwich was the Galaxy Nexus. Most Android phones and tablets released in 2012 will likely be running the operating system; however, we're still likely to see at least a few phones running Gingerbread and tablets running Honeycomb come to stores as well. The Galaxy Nexus is pure Android in that it doesn't have any type of skin on top of Ice Cream Sandwich. Those phones that do have skins, such as handsets made by HTC, Motorola, and others by Samsung, will need to be tested running the OS and their software customized before they can be released. Depending how that process goes, some new devices may be released running an older version of Android, and your existing Android device may or may not wind up getting the update.